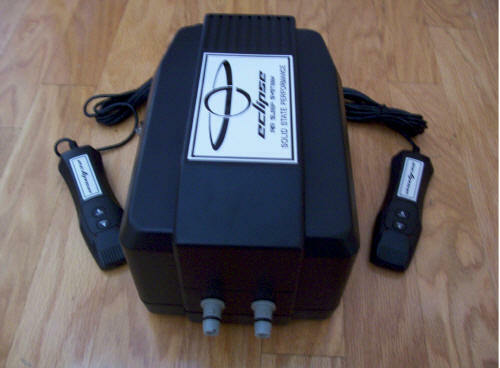 Replacement air bed chambers will fit or adapt to Comfort Craft, Somma, Nautilus, Comfortaire, Strata Halycon, Adjust-a-Rest, Spring Air, Select Comfort* or any mid-fill (6") Soft-Side air bed (compatible with Adjust-A-Rest, Luxury Support, Equinox, Eclipse, and Infinity Air Pumps). 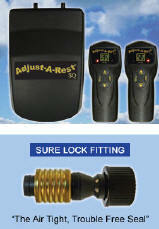 Package Specials With Air Chamber and Pump! New improved leak free air box system. Dual diaphragm for top performance. Larger o-ring provides for easier slip-on and eliminates any leakage at connection. New mounting configuration, reduces the chance of damage during shipping. Large, stronger rubber feet to help prevent damage when dragged. 50 Comfort Settings While most competitive hand wands offer 20 or fewer arbitrary and often irrelevant set point options, dual Luxury Support Ultra hand controls offer 50 scientifically accurate comfort set points. Pneumatic Pump Versus competitive models using unsophisticated electric blower pumps that are underpowered and less efficient. Pneumatic air processors facilitate inflation of Luxury Support air chambers to much firmer levels and provide you the broadest spectrum of adjustability. FEATURES THE "CAM-LOCK" FITTING: The user friendly Cam-Lock Fitting gently twist locks onto the Adjust-A-Rest™ Super Quiet Air Inflator creating an air tight, trouble free seal. The internal pressure valve allows for the chamber to be disconnected from the inflator for ease of moving the bed or for accurate service diagnostics in the field. 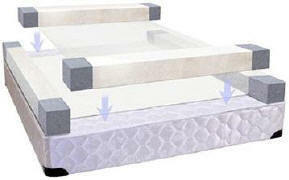 Replacement foam (bolsters) to replace any 6'' foam perimeter that encases either waterbed mattress or air bed chambers these are perfect if you older bed has began to bulge or the foam has compressed on the perimeter. Our unique visco Memory-Cell® formula forms a closed cell structure that makes the 1" insert superior to ordinary memory foam. Heat Sensitive, State-Of-The-Art Technology that conforms and molds to the curves of your body through body heat, simulating a flotation effect. 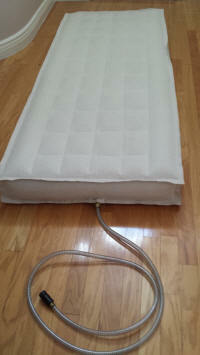 This is not your typical "egg-crate" foam pad. 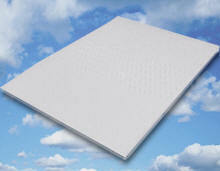 3-Zone 1 inch foam inserts are manufactured with extra-thick, high-density polyurethane, convoluted foam. 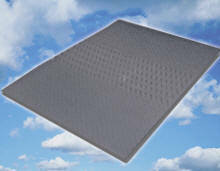 High quality convoluted foam provides gentle comfort and durability! Formed with a unique combination of three distinctive zones to reduce stress on the pressure points and provide customized support for your entire body. Thicker & more durable, the original Euro design of the InnoMax Air Chamber provides a full 6" of air suspension for pressure reduced sleep. The vulcanized process virtually eliminates all seams. The material actually flows together & becomes a one piece construction. 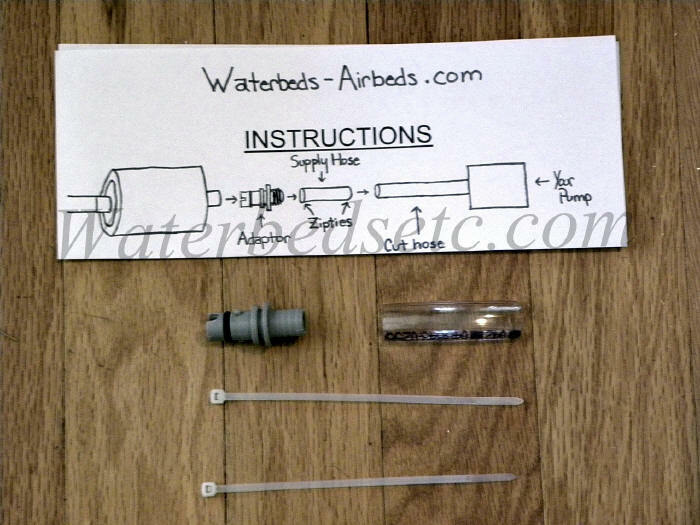 Unlike competitors using PVC plastics that outgas, Waterbedsetc Air Chambers are made with natural cotton bonded to natural latex offering a soft texture and eliminating air leakage. The Chamber borders are constructed with a 1.25" seam and reinforced with another 1.25" seam for maximum strength. Double sealing creates a more reliable support system for years of proven longevity and trouble free use. While other "C" Beam construction offers only one side sealing, the dual side "I" Beam is actually two layers of canvas with two layers of rubber bonded together joining the top and bottom of the Air Chamber. Where this "I" Beam meets either the top or bottom, the canvas/latex flairs out each way offering twice the holding power for extra strength and years of durable use. Waterbedsetc Chambers feature a "square pillow surface" to evenly support the body from head to toe, side to side, & at the edges of the chamber regardless of inflation level for the ultimate in comfort. This design also allows sleeping in the center of the dual models without the need of a foam wedge and with no sensation of rolling to either the middle or edge. Competing designs allow only horizontal air flow, which can actually cause a cupping or hammocking effect leading to improper support. By sealing the air hose with special flexible rubber at the time of chamber manufacturing, the entire assembly is a single unit with no external connections to eliminate the concern of air loss, yet retains the full range of movement. The addition of the embedded surgical steel coil provides a quieter and more responsive inflation process. The kink free design improves pump life and offers precise comfort adjustment. Engineered to assure zero air loss at critical hose/connection juncture and provides a much more durable connection. 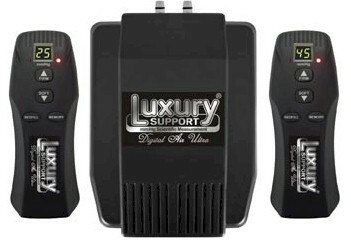 Easy to use barrel connector locks in place to prevent accidental disconnect during use and is not rendered ineffective by dust or pet hair commonly associated with clip on connections. 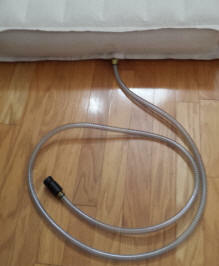 The Twist-N-Lock connector houses the unique seal that prevents the back flow of air allowing the bed to be moved without the need to deflate the chambers. Designed for maximum air flow in all directions, the air chamber creates the proper spinal alignment required for pain free sleep. Competing designs allow only horizontal air flow, which when releasing air to create a softer feel can actually cause a cupping effect leading to improper support. Air suspension chambers feature a "square pillow surface" to evenly support the body from head to toe, side to side, and at the edges of the chamber regardless of inflation level fro the ultimate in comfort. This design also allows sleeping in the center of the dual models without the need of a foam wedge and with no sensation of rolling to either the middle or edge. By sealing the air hose with special flexible rubber at the time of the chamber manufacturing, the entire assembly is a single unit with no external connections to eliminate the concern of air loss, yet retains the full range of movement. The addition of the imbedded surgical steel coil provides a quieter and more responsive inflation process. 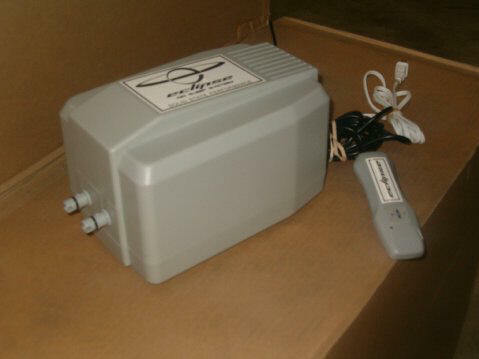 The kink free design improves pump life and offers precise comfort adjustment. Engineered to assure zero air loss at critical hose/connection juncture.